Inspired by the extraordinary true story of a brilliant young master of deception and the FBI agent hot on his trail, Catch Me If You Can stars Oscar nominee Leonardo DiCaprio and two-time Academy Award winner Tom Hanks in one of the year's most acclaimed hits! Opening weekend $30.082 million on 3156 screens. Nominated for Best Supporting Actor-Christopher Walken; Best Score-John Williams. Not content to rest on his laurels – and his enormous bank account – Steven Spielberg still cranks out plenty of movies. If anything, he’s become more average as he ages. Three times over the past decade, Spielberg directed two movies in a single year. 1993 remains his “career year”, as he produced the huge hit Jurassic Park and the successful and much-praised Schindler’s List. 1997 became Spielberg’s second two-flick year, but he didn’t hit the jackpot like he did in 1993. His Jurassic Park sequel The Lost World made lots of money but fell short of expectations, while his quest for freedom drama Amistad failed to repeat the acclaim and popularity of List. Critics didn’t think much of Amistad and audiences avoided it. For the third year in which Spielberg put out two movies, 2002 fell somewhere in between the prior two. He released the dark thriller Minority Report in the summer and gave us the light and comedic chase flick Catch Me If You Can in the winter. To be sure, neither film equaled the popularity of Park nor the critical praise of List. Monetarily, neither did as well as Lost World, but no one expected them to match up with that blockbuster, so their box office grosses seemed more satisfying. They also earned generally good critical notices, unlike the lackluster reviews for Amistad. So chalk up 2002 as a good year for Spielberg. 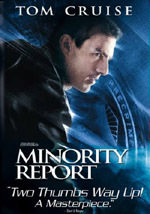 Report showed a mix of weaknesses and didn’t totally live up to its terrific premise, but it worked well as a whole. Another film with a great concept behind it, Catch had its moments, but overall I found it to be something of a disappointment. Based on a true story, Catch focuses on a teenager named Frank Abagnale Jr. (Leonardo DiCaprio). Set in the mid-Sixties, the film leaps around time periods slightly but mostly proceeds in chronological order when it launches from 1963. We meet high school student Frank and his parents Frank Sr. (Christopher Walken) and Paula (Nathalie Baye). At first, it seems as though the family enjoys a nearly storybook existence, but fissures quickly develop. We learn that Frank Sr. has serious problems with the IRS, and Paula’s cheating on her husband. Eventually this forces Frank Jr. to confront a choice: with which parent will he choose to live? Frank selects neither and literally runs away from his problems. Frank flees the home and starts to attempt some check cashing scams. He fails but then gets the idea to impersonate an airline pilot when he sees the ease with which those guys cruise through life. He adopts the name “Frank Taylor” and starts to pass batches of bad checks with the Pan Am insignia on them. He also enjoys all the privileges of an airline employee, which aids his scams; since he can travel for free, he scoots all over the country to spread his fake checks. Frank’s fraud gets more and more sophisticated, which attracts the attention of the feds before too long. FBI agent Carl Hanratty (Tom Hanks) takes on the case, and the pair even meet when he traces Frank to Los Angeles. Frank evades capture, which makes Hanratty even more determined to land his man. The rest of the film follows this cat and mouse side of things. It mostly examines Frank, who we see adopt additional personalities as a doctor and then a lawyer. While we know that Hanratty will eventually catch up with Frank – the film starts in 1969 with Abagnale’s imprisonment – we get to see all the developments along the way. One strength of Catch comes from its cast. DiCaprio seems extremely appropriate for the role of Frank. He possesses the inherent charm and good looks necessary for this kind of part, but he also has the acting chops to pull off its deeper emotional aspects. After DiCaprio turned into a teen idol with Titanic, folks tended to disparage his performance skills, but as shown here, he can pull off rich and affecting work when challenged. He does that in Catch and presents a full and believable performance as Frank. Hanks plays slightly against type as the humorless and obsessed FBI agent. Granted, the role evolves in such a way that Hanratty becomes more warm and fuzzy as the movie progresses, but Hanks keeps him reasonably chilly throughout the flick. It’s fun to see him as someone without a sense of humor; a small running gag related to a “knock knock” joke offers one of the film’s highlights. 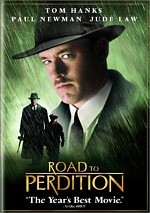 Hanks keeps the character real but backs off the sentimental tendencies; as with his nicely subdued work in Road to Perdition, he doesn’t seem desperate for the audience to love him, which makes his performance very effective. While the actors help give the film some kick, to my surprise, Spielberg doesn’t provide a lot of spark to the film. The tone seems inconsistent, as the movie never fully embraces either side of the coin. Parts of it come across like a bouncy retro romp, while others attempt to delve more deeply into the emotions of the matter. Neither really gels in a satisfying manner. The movie lacks the richness to explore the feelings of Frank and Hanratty, but it dallies with those elements heavily enough to significantly flatten the impact of the lighter moments. It feels as though Catch wants to become a peppy comedy but it never quite gets there. At two hours, 21 minutes, Catch seems awfully long for this sort of fairly light effort as well. I’d think Spielberg could have trimmed at least half an hour from the flick and it would have moved much more smoothly. As it stands, the film dwells on some of the same subjects for too long. It takes forever before Frank actually starts to run his scams. Obviously some set-up was necessary in that regard, but Spielberg belabors the points excessively. It’s very tough for a movie that pushes two and a half hours to really soar, and Catch seems to plod at times. Spielberg’s usual vivid visual touch doesn’t fly here either. Some of the film’s sequences work tremendously well, like when Frank struts through the airport accompanied by a bevy of stewardesses. This kind of tale demands many more vibrant visuals, but they don’t appear frequently. While not a blandly shot film, Catch fails to deliver the flashy images that would work best for it. Catch Me If You Can boasts a compelling true story and a good cast who offer fine work. Unfortunately, its usually rock-solid director falters because he takes too long to tell the tale and also fails to give it much panache or dazzle. Enough of Catch seems entertaining to mean it merits a look, but in the end I was disappointed by it. Catch Me If You Can appears in an aspect ratio of approximately 1.85:1 on this single-sided, double-layered DVD; the image has been enhanced for 16X9 televisions. Parts of Catch looked very good, but inconsistencies made it a less than stellar picture. Sharpness created most of the concerns. Much of the movie appeared accurate and well defined, but exceptions definitely occurred. More than a few shots came across as somewhat soft and vaguely delineated. Jagged edges created no concerns, but a little shimmering appeared; most notably, Frank’s checked shirt strobed a bit. Some moderate edge enhancement raised its ugly head at times; that factor likely led to much of the softness. As for print flaws, other than some light grain, most of the movie seemed clean. I noticed a few bits of grit and a streak or two, but the flick usually looked free from defects. Catch presented a pretty varied palette. It started with fairly drab hues but brightened as Frank’s life became more exciting, and the movie displayed nicely broad and vivid tones when that happened. The colors always appeared tight and well saturated, without any concerns on display. Black levels came across as acceptably deep and dense but didn’t seem exceptional, and the same went for shadow detail. Low-light situations presented fairly clear and accurately depicted images but they didn’t look tremendously concise. Overall, the visuals of Catch Me If You Can seemed acceptable as a whole, but I did think the picture looked somewhat inconsistent. I flip-flopped between a “B” and a “B-“ and went with the higher grade because the movie’s second half looked tighter than the first. Like many DreamWorks DVDs, Catch Me If You Can offered both Dolby Digital 5.1 and DTS 5.1 soundtracks. The pair seemed very similar to me. I thought the DTS version presented slightly better integrated audio at times, but overall, I detected no substantial differences. Not one of the more ambitious soundtracks for a Spielberg flick, the mix displayed a pretty heavy emphasis toward the front speakers. Those channels offered solid stereo presentation for music and also spread out effects well. Mostly the set tended toward general ambience that reflected the situations. It came to life more significantly during a smattering of louder sequences. For example, shots at the airport demonstrated nice movement from front to rear, and a scene with Hanratty at a laundromat presented a fine element of environment. Not a lot happened in the surrounds, but they added a decent feeling of place to the film. Audio quality appeared fine but unexceptional. Speech came across as natural and distinct. I noticed no problems related to intelligibility or edginess. Music demonstrated good bounce and smoothness, and also showed nice dynamics. Effects were accurate and detailed, and they also displayed fine bass response; low-end was rich and tight. Ultimately, the audio of Catch Me As You Can didn’t do much to impress, but it worked fine for the material. This two-DVD release of Catch Me If You Can finds all its supplements on its second disc. It opens with Catch Me If You Can: Behind the Camera, a 17-minute and seven second featurette about the film. 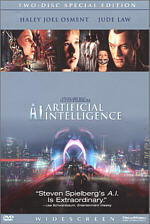 It includes many shots from the set plus interviews with director Steven Spielberg, author/consultant Frank W. Abagnale, screenwriter Jeff Nathanson, producer Walter F. Parkes, actors Tom Hanks and Leonardo DiCaprio, production designer Jeannine Oppewall, property master Steve Melton, costume designer Mary Zophres, and director of photography Janusz Kaminski. “Camera” provides a pretty general recap of the production. It gives us quick notes about the project’s genesis and then mostly concentrates on visual design elements and the rapid pace with which the production moved. “Camera” seems like a fluffy but moderately informative piece. Next we get Catch Me If You Can: The Casting of the Film. It splits into featurettes that deal with these actors: Leonardo DiCaprio, Tom Hanks, Christopher Walken and Nathalie Baye, Martin Sheen and Amy Adams, and Jennifer Garner. Taken together via the “Play All” option, these last a total of 28 minutes and 25 seconds. Spielberg, actors DiCaprio, Hanks, Christopher Walken, Nathalie Baye, Martin Sheen, Amy Adams and Jennifer Garner, author/consultant Abagnale, and producer Parkes. While it offers lots of fluffy praise from the participants for each other, “Casting” also gives us great notes about its topic. We learn how each of the actors got their roles and find other terrific tidbits like Adams’ strategy to stand out and Walken’s variations for different takes. The footage from the set bolsters these pieces as well, especially when we see a number of Walken’s different stabs at one scene. “Casting” provides too much fluff to seem consistently excellent, but it compensates with a great deal of solid material. 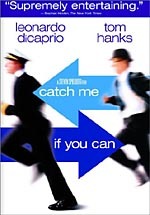 For information about the movie’s music, we move to Scoring Catch Me If You Can. The five-minute and 23-second featurette includes comments from composer John Williams and Spielberg. Williams discusses his themes and motifs, while Spielberg mostly chats about the use of popular music in the flick. The brief program gives us a modicum of decent facts insight but it fails to heavily explore its subject. After this we move to a domain called Frank Abagnale: Between Reality and Fiction. This splits into four featurettes. Meet Frank Abagnale runs five minutes and 19 seconds and includes remarks from Spielberg, DiCaprio, Hanks, and Abagnale. The movie folk give us their general feel for the film’s subject, while Abagnale briefly discusses his motivation for his dash from home as a teen and leads up to his first attempts to pass bad checks. The four-minute and eight-second Frank Becomes a Pilot picks up from there. Abagnale covers the methods he used to get into the flight industry and tells us why he abandoned that approach. Frank’s Careers lasts 119 seconds as Abagnale’s decision to “branch” into medicine and the law. Frank Gets Caught and Turns His Life Around runs three minutes, 34 seconds and shows Abagnale as he discusses the end of his criminal road and the events that followed that. I don’t know why the DVD divides these four featurettes, as they’re really just one longer piece. It doesn’t matter, though the absence of a “Play All” option seems odd since the four appear designed to work as one longer program. We already know much of the info from the film itself, but it’s cool to get Abagnale’s real-life perspective. The featurettes also help us distinguish actual events from cinematic fiction. For more factual information, we get The FBI Perspective. This seven-minute and five-second featurette provides a few lines from Spielberg but it mostly concentrates on the remarks of FBI Technical Advisor William J. Rehder. He discusses the stabs at historical accuracy in the film and also lets us know about the field of check forging and other related topics. Too much of the time, Rehder just tells us what a great job the movie people did, but he adds enough perspective to make this featurette worth a look. As its title implies, Catch Me If You Can: In Closing ends the video section of the DVD. It runs four minutes and 57 as it provides valedictory statements from Abagnale, Parkes, DiCaprio, Hanks, and Spielberg. Little of what they say seems compelling, but “In Closeing” merits a viewing if just to see the take of one scene that Hanks does with his mouth full of Chinese food. Now that we’ve finished with the video programs, we go to the Archives Photo Galleries “Cast” (49 pictures), “Behind the Scenes” (27 images), and “Costume Design” (11 drawings). The latter is the only moderately interesting set of stills, and in a nice touch, it allows you to check out the final costumes as they appear in the film as well. Cast includes short bios for actors Leonardo DiCaprio, Tom Hanks, Christopher Walken, Martin Sheen, Nathalie Baye, Amy Adams, and Jennifer Garner. Filmmakers features entries for director Steven Spielberg, screenwriter Jeff Nathanson, author/consultant Frank W. Abagnale, producer Walter F. Parkes, executive producers Barry Kemp, Laurie MacDonald, Michel Shane and Tony Romano, co-executive producer Daniel Lupi, co-producer Devorah Moos-Hankin, director of photography Janusz Kaminski, production designer Jeannine Oppewall, editor Michael Kahn, costume designer Mary Zophres, and composer John Williams. All of these provide rudimentary but decent discussions of the participants. Finally, we get two separate collections of Production Notes. “Colorful Characters” traces the story’s path to the screen and then gets into casting and character insights. “A Colorful Time” mainly covers visual design, locations, and the score. Both offer reasonably good examinations of their topics. One positive element of this DVD: all of the video extras come with subtitles. These appear in English, French, and Spanish. One surprising negative: unless I missed it, we don’t find the trailer for Catch. This makes it the only DVD for a Spielberg film that doesn’t feature that flick’s trailer. I wanted to like Catch Me If You Can and I expected to like Catch Me If You Can. Really, I guess I did like Catch Me If You Can, but not as much as I anticipated. The movie offers a number of positives but seems too slow-paced and erratic to be a rousing success. The DVD features good but lackluster picture and sound with a set of similarly uninspiring supplements. A fairly average film and DVD, Catch Me If You Can deserves a rental but I can’t recommend anything beyond that.